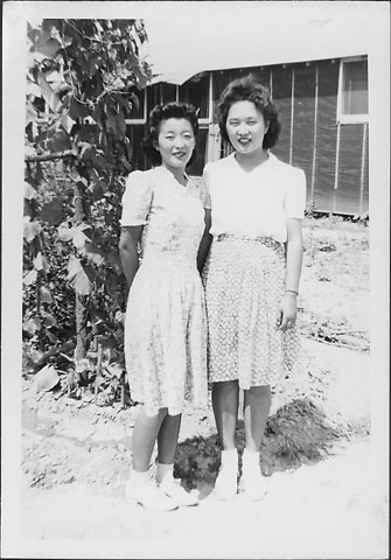 Full-length portrait of two smiling women standing next to vine-covered trellis in front of a barracks at Rohwer concentration camp, Rohwer, Arkansas, July 9, 1944. Woman at R wears patterned skirt, white short-sleeved blouse, and bracelet or small wristwatch. Woman on L wears a white spiral-patterned dress. Close-up image of 97.292.6BZ. Woman on L also in 97.292.6AC, 97.292.6AW, 97.292.6BD, 97.292.7F.